October, 15, 2011, at the Institute for the Humanities and IT starts the first stage of the Festival of Knowledge. Its organizers made their best to create a perfect holiday for the schoolchildren of Moscow and the Moscow Area. 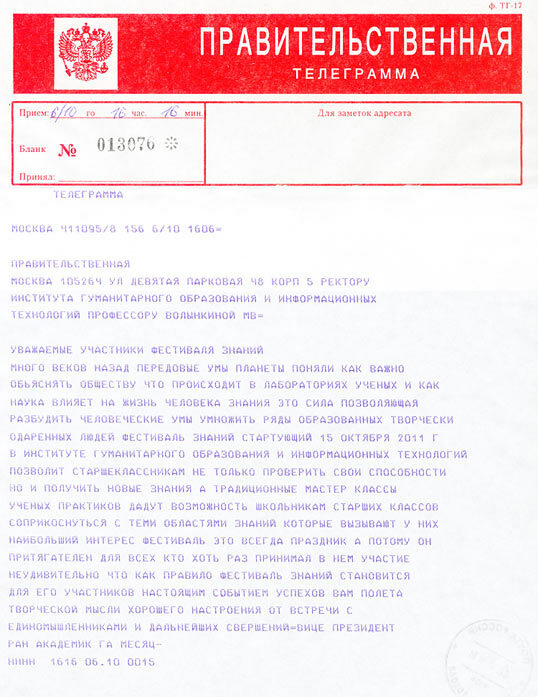 The day before, a governmental telegram, signed by G. Mesyats, academician, vice-president of Russian Academy of Sciences, came to the Institute. The famous scientist evaluated the Festival movement as a most important event and wished to the participators high flight of their creative ideas! Apart from the participation in the Subject Olympiads, and the presentations of the Ecological Design Projects, the schoolchildren will have a lot of interesting opportunities such as to visit the unique master classes, to check the correctness of their future profession, to draw at the Art Studio of the Institute under the direction of professional artists, and to taste the delicious home pies. The success will be estimated at true value: the schoolchildren will get a lite variant of the IGUMO entering exams, or anyway it will bring them more confidence while entering another Institution of Higher Education. The unique souvenirs, gifts and a lot of surprises are prepared for the winners of the Olympiads and the participants of the quiz-games and master classes of the Festival of Knowledge! The participation is for free! IGUMO is glad to discover your talents!